Vitamin D is essential for absorption of calcium which is vital for good bone health. 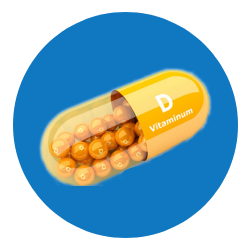 The Recommended Dietary Allowance (RDA) for adults is 600 international units (IU) of vitamin D in a day and 800 IU a day, for those older than age 70. To meet this level, foods that are rich in vitamin D such as fortified foods, dairy products (milk, yogurt), and fish, such as salmon, trout, tuna must be a part of the diet. Nutritious vitamin D-rich diet ( foods that are rich in vitamin D such as fortified foods, dairy products (milk, yogurt), and fatty fish, such as salmon, trout, tuna).